Can I Play South Africa Powerball Online? Read Reviews! 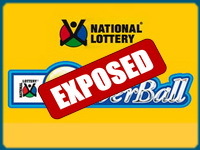 South Africa Powerball Exposed — Your Chance to Win Big Bucks? Looking for yet another lotto opportunity to try? Something that features much better odds than the vast majority of US and European lotteries? Ok, the jackpot numbers for this particular one aren’t this big but you can still end up winning a nice amount. If you’re really into finding such an opportunity, you may want to try the South Africa Powerball. So, if you’re a newbie, here are the ABCs of South Africa Powerball. Far from complicated, this game does have a number of tricks up its sleeve (so to speak), which is why you need to acquaint yourself with its quirks before getting started. Is South Africa Powerball a Scam? Maybe we should start by answering the most important question first. South Africa Powerball isn’t a scam, it’s in fact a game offered by the country’s national lottery. It’s one of the newest games in the country and it was established in 2009. The good odds and the relatively big jackpots in comparison to other South African games, however, have quickly boosted its popularity. Now that we know it’s a legitimate opportunity, let us take a look at how the South African Powerball should be played. Draws take place each Tuesday and Friday. The minimum jackpot per draw is three million South African rand. If no player matches all of the numbers required to win the jackpot, the sum is rolled over to the next draw. This is how the jackpot can keep on increasing and increasing. The largest sum that it has ever reached was 102.016 million rand or approximately 7.36 million US dollars. Players have to choose five numbers in the range from one to 45. They also have to choose a Powerball in the range from one to 20. The jackpot is won when the player gets all five of the numbers plus the Powerball correct. Keep in mind that only the jackpot rolls over to the next draw. If there are no winners for the lower tier prizes, the amount will be rolled down to the closest tier. As a result, people that match few numbers and are particularly lucky during the given week can end up winning a juicy sum. The odds of winning the South Africa Powerball jackpot are one in 24,435,180, which is sooo much better than many US and European lotteries! The odds of winning the EuroMillions jackpot, for example, are one in 116 million. The odds of matching five balls without the Powerball number are one in 1,286,062 and the distribution of the winnings is 13.33 percent (in comparison to 42.07 percent for the jackpot). Matching four main balls and the Powerball has odds of one in 122,176 and matching four main balls without the Powerball – 1 in 6,430. These numbers will probably be a bit more meaningful if we add actual prize amounts. Needless to say, these are just averages. The exact numbers will usually depend on the number of winners per each tier. Thus, a person that matches the five main numbers without the Powerball can expect to win an amount in the vicinities of 30,000 dollars. Four balls matched plus a correct Powerball will bring a prize of approximately 1,500 dollars. All other correct number combinations bring much smaller earnings to the table. Here’s the next big question that we’re certain you’re going to ask – are South Africa Powerball earnings taxable? We’re going to make you happy by saying that the winnings are paid out in tax-free lump sums. Still, to be on the safe side, you may want to check the laws and regulations in your own country. To play Powerball and win, you must be aged at least 18. If you win, you will have 365 days from the date of winning the prize to claim the money and make arrangements for having the payment processed. It all sounds pretty great so maybe we should discuss some specific tips for increasing your odds of becoming a South Africa Powerball millionaire. You may want to wait some time until the jackpot accumulates. Still, buying a single ticket is quite affordable in comparison to many other lotteries and you can most definitely have your weekly entry. There are some recommendations for trying a relatively even number of even and odd number picks. It’s very rare for one draw to feature only odd or only even numbers, thus a good mix of both will be the most reasonable strategy. Some people have estimated that’s it’s best to have three odd and two even numbers. Whether you’re going to take this advice is up to you. People that are from South Africa can buy Powerball tickets from local stores, through the game’s official website and through a mobile app. If you’re an international player, you will have to look for a lottery concierge service. This service usually consists of an online platform that enables you to buy lottery tickets in many countries. The service provider has a local rep in each country. This local rep will be responsible for buying your ticket and helping you out with collecting the prize you win. Would you mind rating SA Powerball? To sum it up – South Africa Powerball is a legitimate opportunity that comes with standard odds and a delicious non-taxable jackpot. This isn’t a scam so if you’d like to try yet another international lottery, you may want to give this Powerball a try. How Much Does It Cost to Play SA Powerball Online? Though the price of a lottery ticket is pretty low, so is the jackpot and other tier prizes. This is definitely not one that is going rake in a mega jackpot prize. Then again, it does have better odds than some of those mega jackpots. I think I will take a look and see if the prizes are really consistently that low.